Welcome to the Vanderbilt Eye Institute Histology Core. The Core offers services to Vanderbilt Vision Research members on a first come first server basis, with priority given to jobs submitted by “investigators”, followed by those submitted by “associates”, and finally, “affiliates”. The histologist would like to meet with everyone before they start their project. How the samples are prepared is crucial to the quality of the slides. Please contact the histologist to go over your projects and make the best plan so the histologist can provide you with top quality service. The Histology Service will be administered according to the guidelines of the NEI Core grant that supports it. In short, the Core grant pays for labor and the investigator must pay for supplies. 1. Where is the VVRC Histology Core Lab? 2. Who can use the VVRC Histology Core Lab? Anyone associated with the VVRC can use the Histology Core Lab. This includes investigators, staff, associates, and affiliates. 3. How do I use the VVRC Histology Core Lab? Start with an email to the histologist. A meeting will then be arranged to discuss your needs for your project and make a detailed plan to address your special needs. 4. How long does it take to have my work completed? Everyone’s project is important. Our goal is to work as quickly as we can to provide top quality work on the projects in the order they were received. If you have a deadline to meet, special consideration may be made in consultation with the histologist. 5. What do I need to bring with my samples? 6. What is the acknowledgement policy? If you have used VVRC Histology Core services, it is appropriate to acknowledge the services of the Core in the following manner: Vision Core Grant: P30 EY08126. If the histologist has substantially assisted in the design, execution, and interpretation of you data, it is appropriate to consider an authorship role for the histologist in consultation with the Core Director. 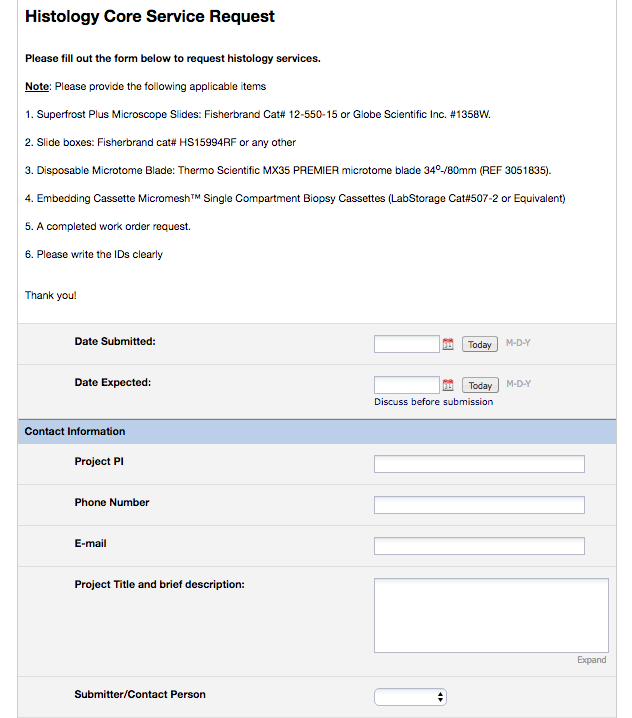 Are you ready to make a Histology Core Service request? Go the official Histology Core Service Request RedCap form by clicking the image below.